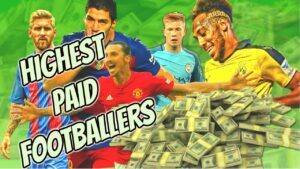 Top 25 Footballers With Highest Salaries In World Football Cristiano Ronaldo with $ 321.5 million net worth and annual earnings of $ 24.4 million is holding the top position of world richest football players although Ronaldo earns £ 5 million less than Messi in terms of football contracts but this super star due to his global portfolio of more than 3.5 million followers remained in lime light for different sports brands like Nike, Tag Heur and Armani. No doubt the sponsorship deals for Ronaldo are way far than offered to Messi who earns $33.4 million annually and his annual gross income increased after his renewal his contract with Barcelona. The Argentine Superstar Lionel Messi holds net worth of $295 million whereas he makes $ 27 million in terms of his contracts with different sponsors like Adidas, Pepsi, Gillete and Turkish Airlines. Messi plays for Barcelona in Spanish Liga as striker and he is the leading goal scorer of this football league. As per the news Lionel Messi also runs his own business and earn $50 million annual apart from his football and endorsement deals with different big brands. Neymar is the 3rd richest footballer on the planet with annual earnings of £ 28.8 million. Neymer joined Messi and Ronaldo after moving to PSG last summer and earn a huge contract of £200 million and broke the world transfer record. Neymer also earns $17 miilion annuially in terms of different endorsement contracts with different brands like Nike, Gilette and Red Bull and he runs his own business company named NN Consultoria and earns $73 million from this business.